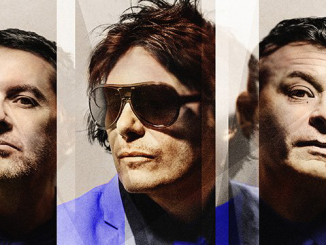 HomeVideosMANIC STREET PREACHERS share new single ‘Distant Colours’ – Watch Now! 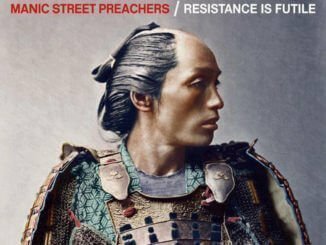 Taken from their forthcoming 13th studio album ‘Resistance Is Futile’, ‘DISTANT COLOURS’ is released today on Columbia/Sony. The album is now released 13th April having been pushed back a week. 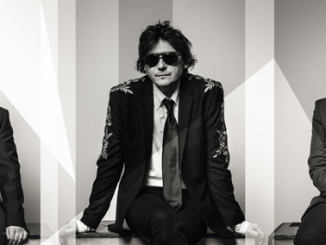 The first track from the new album ‘International Blue’ came out in December and was quickly added to the A-lists at Radio 2, 6 Music, Virgin, Absolute and Radio X. The band have also been announced on the line up for the BBC Biggest Weekend on 25th May at the Titanic Slipways in Belfast as well as slots at several UK festivals. With a video shot in Wales, it sees the central character from International Blue – actress Sarah Sayuri – criss-cross the country stopping off at key historical and cultural sites of interest that in some way relate to some of the themes in the song. Shot by long term collaborator Kieran Evans, the film passes sites such as the famous ‘Cofiwch Dreweryn’ (Remember Treweryn – the protest memorial to the drowning of the village Treweryn) and the statue of Welsh warrior Llewelyn ap Gruffydd overlooking Llandovery. It then weaves down through the plains of the Brecon Beacons to find ourselves in front of the Aneurin Bevan ‘Stones’ on the windblown edges of Ebbw Vale. Further south, to the extraordinary miners memorial ‘Guardian of the Valleys’ in Six Bells, Abertillery and on to the Chartist Monument on the outskirts of Blackwood before arriving at the towns Little Theatre the site of the third ever Manics gig.